Montegiove Castle is a prestigious and refined Country House placed in a panoramic place on the hills of Fano, 2 miles from the Adriatic sea and 2 miles from the Highway. 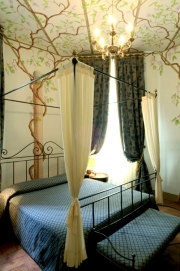 Thanks to the painted furnished rooms, the antique style furniture of great value and the suggesting surrounding of this aristocratic mansion, guests will be carried in a late nineteenth century warm atmosphere. The rooms, are characterized by antique flooring. It still conserves original wooden beamed ceilings and tiled flooring, wrought iron beds and furniture and ceramics made by skilled local craftsmen. The charming restaurant offers typical local dishes. The Dining rooms are elegant and reserved. The wine-cellars, dug out of Tufa, offer the possibility to taste wines chosen from the many high-quality local products, and the best Italian ones. The ex wine-cellar premises, ideal surrounding for ceremonies, the panoramic square with on a natural terrace, the courtyard area, all contribute to an ideal success of any kind of event. Highway A14, exit Fano, take the Flaminia road in direction to Rosciano. turn on the right on Monfalcone street and than to the left in Montegiove street, after 100 meters you'll see the way in of the Castle on your right.